A very useful modellers reference, lots of photographs and great information on colour schemes including Russian delivery scheme, Czech scheme and two schemes applied by WZL post overhaul. Limited text but sufficient to convey the point. A great book not only for those interested in the Polish Air Force or who wants to model a MiG-29 (9-12) aircraft in general thanks to the wide selection of detail walk around style photographs. The Author is on his home turf and a very useful modelling reference has resulted. For any Warsaw Pact country in the late 1980’s the MiG-29 represented the pinnacle of fighter capability, being broadly similar in capability to the US F-16 then entering NATO service. Unsurprisingly one of the recipients of the MiG-29 was the Polish Air Force, which after much negotiation, started to get the Fulcrum in 1989 and would ultimately replace its fleet of ageing MiG-21 and MiG-23 fighters. Not only did they source these airframes direct from Russia but also obtained surplus airframes from Czechoslovakia and later Germany. Although now starting to be equipped with late model F-16s from the US as a NATO member, updated MiG-29s will continue in service with the Poles for the foreseeable future. 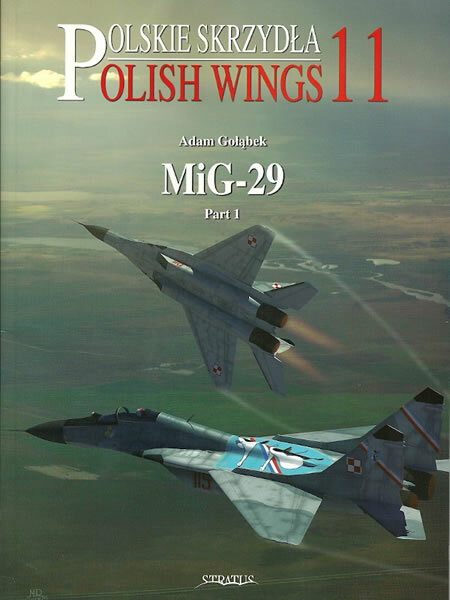 As a result the latest volume of Mushroom Model Publications Polish Wings Series is a timely addition to the reference shelf, covering the original MiG-29s purchased from Russia and the later Czech airframes. This book is clearly intended to be a reference of value to modellers, with the first clue being the advertisement for an upcoming Techmod decal sheet which provides options for many of the schemes covered in this book. 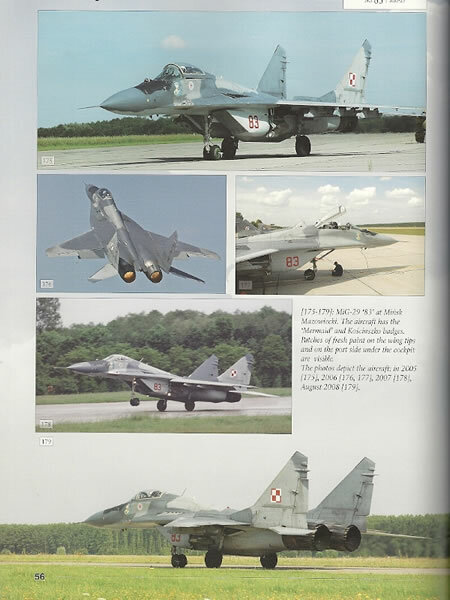 The majority of the book is then turned over to comprehensive photo coverage of Polish MiG-29s, with about ten pages of text and tabulated data at the start giving a brief background to the acquisition of the Fulcrum by Poland and its subsequent service. The majority of the photos are overall shots of airframes and serve to document camouflage and markings over the period of operations from 1989-2009. These are supported by detailed colour four view and side profiles along with close up photos and drawings of the unique markings applied to the airframe along with a table of Federal Standard colour cross references. The final three pages provide some excellent large format colour shots of the cockpit area for the super detailers. 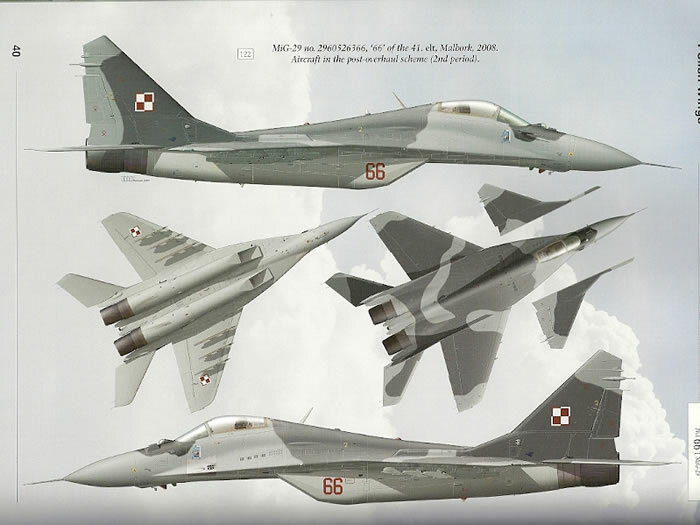 Whilst I cannot confirm it, it seems that just about every MiG-29 Fulcrum A airframe (note not two seat MiG-29UBs or ex-Luftwaffe airframes as these are the subject of Volume 12) in Polish Air Force Service is represented in this book along with all the variations of colour schemes applied. Whilst an extremely narrow subject, PAF MiG-29s carry some attractive schemes which alone makes the book worthwhile. Add the extra detail that can be extrapolated from the numerous photographs and this becomes an excellent reference for anyone wanting to model a MiG-29 Fulcrum.